Russia luxury smartphone maker has partnered with China’s Huawei in coming up with a new variant of the Huawei P9 flagship dubbed the Friendship Edition. The Huawei P9 Friendship Edition comes in two variants that are meant for the Russian and Chinese markets. 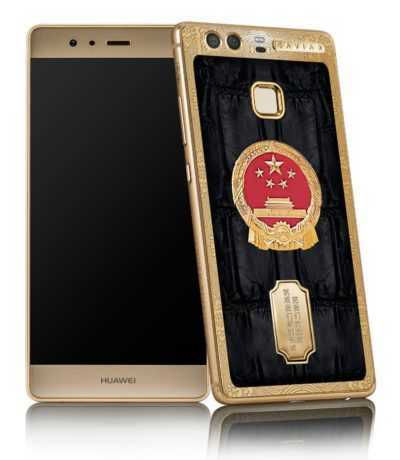 However, since the Russian outfit is only known for making luxury handsets, the number of models produced by the two is limited to just 88, a figure that is associated with good luck in China. With this in mind, it means this phone will be rare to come by. As noted, the Huawei P9 Friendship Edition comes in two variants. Where the Russian variant has a rear panel that has a lot of Russian written on it, the Chinese model comes with, well, Chinese written on the back. Each country’s model has a message that goes hand in hand with its culture as well as anthems. Those in China will see a state of Arms that is made of gold and granite while those in Russia will see a rear panel with a relief coat of arms representing the Russian Federation. In terms of hardware specs, the two Huawei P9 Friendship Edition phones are not different in any way. In fact, nothing has been changed when compared to what the standard Huawei P9 comes with. This means you still get a 5.2-inch display screen with a Full HD resolution. The processor remains to be a HiSilicon Kirin 955 and is paired with a RAM of 4GB, although the standard P9 also ships with a base model of 3GB RAM. The storage is capped at 64GB, but of course, this can be expanded via a microSD card slot, just in case you feel it’s not enough. The Huawei P9 Friendship Edition comes preinstalled with Android Marshmallow out of the box, but as you may know by now, there is an update to Android 7.0 Nougat already out there.